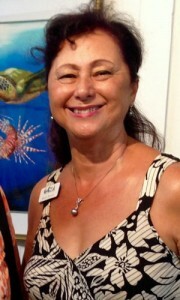 Maria is Chairman of the Gulf Coast Arts Alliance. A native of Hawaii, Maria likes to capture the ocean in its purest form and enjoys painting flowers that grow locally and some from her home area. Many of her marine life works have been selected for purchase and display in prominent coastal businesses.